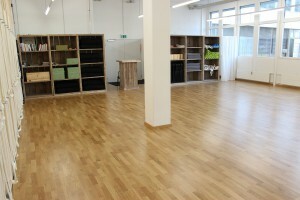 The studio has a surface of 100 square meters, plus a changing room and reception area of 30 square meters. 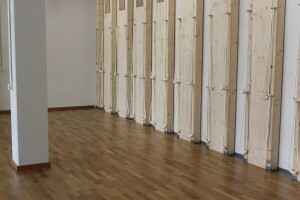 The beautiful wooden floor, the white walls and the height of more than 4 meters make practicing yoga very enjoyable. The studio is furnished with all kinds of props that are used for Iyengar Yoga. There is also a rope wall (10 meters long). The floor in the studio is a special dance-studio floor (Boen Actiflex Stadium). The studio can be rented (page in German).